Yolanda, Isabel’s sister, and Margola, Isabel’s sister-in-law, came over very early this morning to finish the preparation, and then cook, the fanesca. In fact, they were here before I got up. Preparing and cooking fanesca is very labor intensive. For the choclo, corn had to be shucked, the kernels being prepared in a certain way. Each kernel had to be removed by hand. Then, if a kernel didn’t come off exactly right (which only about one kernel in ten did for Marilyn), a hard part of the kernel had to be picked off by hand. Marilyn did one ear of corn yesterday and quickly found another job. Victoria did most of this work. 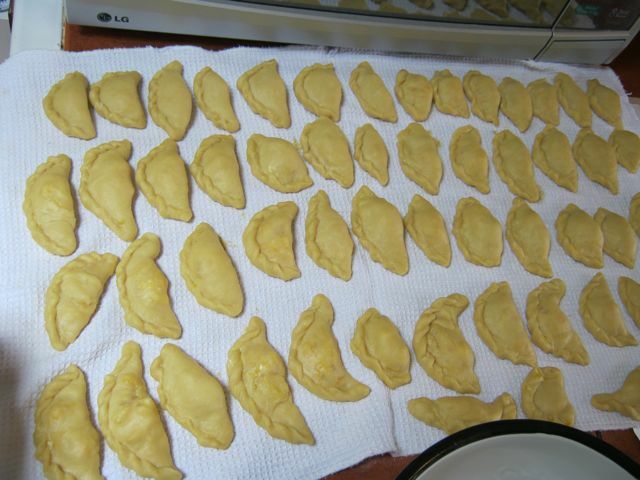 Empanadas (lots of them) had to be made and stuffed by hand, then boiled in vegetable shortening. Hava (fava) beans had to be individually peeled. It was hard work, but it was also a time for members of the family to talk and laugh with each other. Cesar, Isabel’s brother, Luz, his wife, and Maria Agusta, their daughter, came about 10:00 a.m. to help. Of course, Marilyn was helping all morning, too. She learned, or tried to learn, the art of making an appetizing looking empanada. Hers looked distinctly different from anyone else’s, though, and took considerably longer to make. It was kind of like watching knitting pros teach a novice. 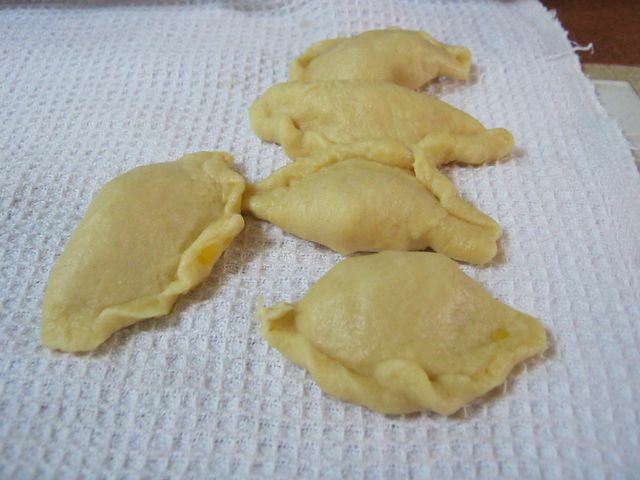 Marilyn's empanadas may not have looked as pretty, but they tasted as good as the others. I mainly sat around and opened my mouth when any tasty morsels came my way. The event was much akin to the preparation of a Thanksgiving meal in the U. S., when every dish is made in one house. 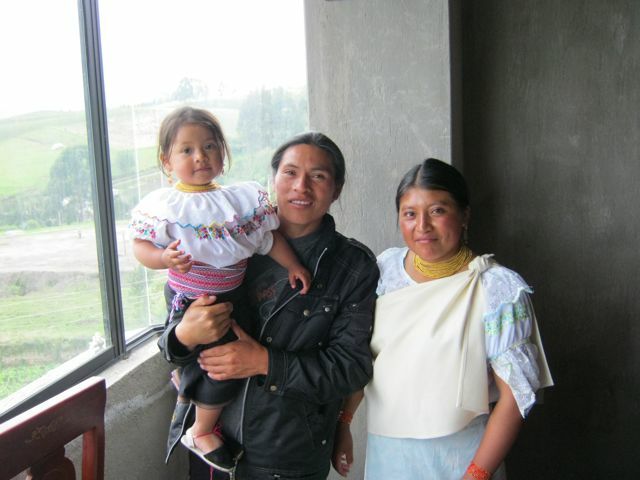 Patricia, Isabel’s sister, also came from Cayambe, 20-30 miles away, for the meal. She brought her daughter Karen. We were glad, because Patricia was the only child of Victoria’s whom I hadn’t met. Click the bowl of fanesca for more pictures. Ten adults sat around the table in the comedor to eat. Three children sat around the table in the cocina. I don’t usually eat soup, because it’s so runny that it usually gets all over my chin and clothes, but the fanesca had the consistency of thick clam chowder. 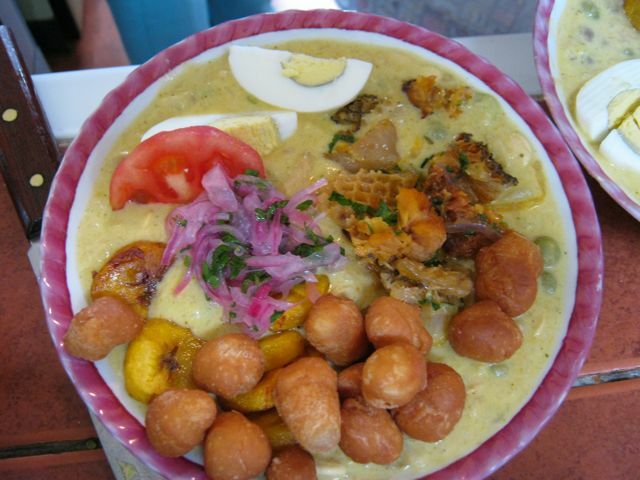 I liked the fanesca,… except for the dried fish in it. I like fish as a rule, but this was, well, really fishy. The soup was rich, so I was quite full by the time I had eaten a little more than half. Never was I so grateful to have a good excuse to stop eating something. It had gotten harder and harder for me to chew and swallow everytime I got a piece of fish. Thankfully, I wasn’t alone. Elvis and Marilyn didn’t like the fish, either. When I stop to think about it, for Christians, Good Friday is a time to be thankful – thankful that Christ died for their sins. Last year at Easter we were introduced to the tradition of a procession on Good Friday (see “Easter in Otavalo”). This year, living with a family, we experienced other traditions. Tokayo, a nephew of Isabel’s, had also brought over 20 liters (about five gallons) of fresh milk to be used in the preparation of the fanesca, donated by his father, Alfredo. Everything for the fanesca is cooked in milk instead of water. I asked if that was for a religious reason and was told, “No, it just tastes better.” Isabel had gone to a mercado with her sister-in-law, Margola, at 6:30 a.m. this morning to get other ingredients, including the salt cod mentioned by Wikipedia. Isabel and Victoria worked on meal preparation all day and Marilyn helped all afternoon. At 7:00 p.m., we went to mass. The church usually has a figure of Christ hanging behind the altar. Tonight the altar had been moved forward off its platform and there was a white curtain separating the participants in the mass (including the priest) and the platform. It was interesting that three hymns sung in Spanish had recognizable (to me) tunes. The first tune I recognized was Peter, Paul, and Mary’s “Where Have All The Flowers Gone”. The second was “The Battle Hymn of the Republic”. The third tune I recognized was Simon and Garfunkel’s “Sounds of Silence”. Actually, I had noticed this one on Palm Sunday. During a pause in the lyrics (whatever they are), the Lord’s Prayer was recited. It was very interesting and, knowing many of the lyrics to “Sounds of Silence”, I found it spiritual to recite the Lord’s Prayer in the midst of that tune. Click the church for more pictures. Another thing I found unusual in this Catholic church was the foot washing ceremony. I’ve seen some foot washing ceremonies at United Christian Church, our home church, but never in a Catholic church. Of course, the vast majority of my experiences in the Catholic church came when I was growing up, and the church was quite a bit different then. Near the end of the mass, the white curtain was lowered, revealing many beautiful flowers, but no figure of Christ. It had been hidden by yet another curtain. As we were leaving the church, I noticed that any other figures of Christ had been draped and hidden from view. If this had been Good Friday, I could have guessed what the symbolism meant. But this was Maundy Thursday. I have no idea what it meant. 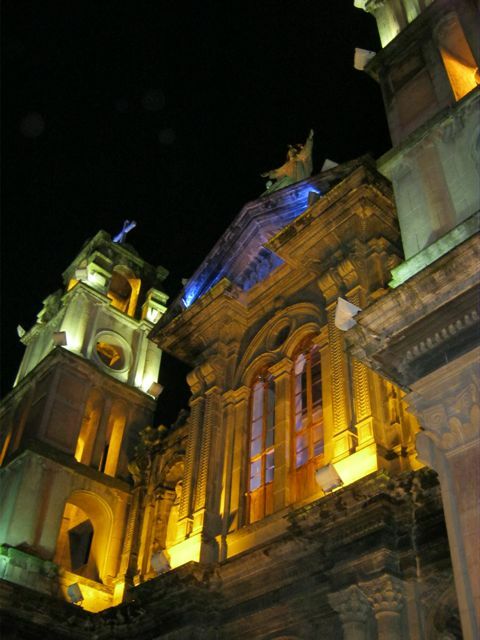 After mass, we drove downtown to walk around and look at all three of the main churches in Otavalo. They were really pretty. All of them were open and decorated differently for the Easter season. Victoria hadn’t been feeling very well Wednesday or today (in spite of all the work she did), but she seemed to enjoy walking around, visiting, and praying in the different churches. We kept running into family members during the whole time because everyone visited the churches at their own pace instead of in a large extended family group. Today is Palm Sunday, the start of Holy Week, or Semana Santa. We’ve been looking forward to going to church all week. I think Victoria has, also. It’s not raining this morning, for a change, and we’re really grateful for that. We can walk to the Catholic church about a mile away. With her health problems, it’s amazing to see Victoria walk that far, and farther. I grew up Catholic and, unlike many Catholics, I didn’t drift away due to disillusionment with the Catholic church (though the sexual abuse brought to light in recent years surely would have tested my faith). I drifted away from religion in general because I found so much inconsistency in the types of religion I knew about. I even drifted away from God. However, all the theories that I learned about could never explain to me adequately how our universe, and probably other universes, began. Therefore, I’m back to a belief in some sort of God. That sounds like a pretty tenuous reason for a belief in a God, but there you have it. All this is to say that I feel comfortable in Catholic churches. I like its rituals. I like the soothing sensation of years of recited prayers. I can even (somewhat) follow along in Spanish. So I enjoyed being in church today, despite feeling tired from the moment I woke up. Instead of palms, each family brought at least one plant. I was waiting for a procession, as I’ve seen in so many other churches. That didn’t happen, though. At the end of the service, everyone with plants went to the altar to have them blessed. As at Christmas, when each family’s doll in the image of Jesus was taken to be blessed by the priest, it was more of a stampede than an orderly affair. On the walk home, Elvis asked me if I wanted to go to Lago Yahuarcocha for tilapia. Because I was tired, and we were expecting company at 4:00 p.m., and we had had company the previous evening, I said no. But behind us Isabel had gotten an affirmative answer from Marilyn. I knew that if I tried to stay behind, no one would go. That’s just how this family is. When we got to the tilapia restaurant, it was pouring. I wanted to wait until it slacked off a bit, but everyone else was hungry and dragged me out of our warm, dry car. They tried valiantly to keep me dry, but I still got pretty wet. We sat under cover, but it was in the open air. Before we had left home, I had asked Marilyn to take my sweater off, but put it in my backpack just in case I needed it. Ibarra is usually much warmer than Otavalo, but not today. She got the first part of my request, but not the second. Thus, I could look forward to being wet and cold. Marilyn graciously gave me her jacket, but I still got cold. I’m afraid I acted like a jerk during the meal. I hardly said anything, and I think I smiled once. Because I hadn’t wanted to come in the first place, one thought kept repeating in my head: “I knew it. I knew it. I knew it…” Why do we have the ability to talk ourselves out of having a good time? When we got home, I was able to read and nap until our company came. Thus, I finished the day in a mood much as it was when I woke up this morning. I was able to enjoy our company, even winning at Settlers of Catan, but I had been a real grouch today. I haven’t updated the blog for a while. We were in the U.S. from Feb. 16th to Mar. 14th, and I’m finding it’s hard to write anything while we’re there. Almost immediately after we returned, Blanca gave me a deadline for having a mock-up of the FEDICE website ready, so I’ve worked on that pretty much since our return. Since we’ve moved into our own house, we’ve entertained pretty regularly. One group of people we’ve entertained has been Isabel’s extended family. They are often a lively bunch. Also, when you invite a family of four you’re likely to end up with twelve people, as happened recently, and have to scramble to find enough food to feed everyone. 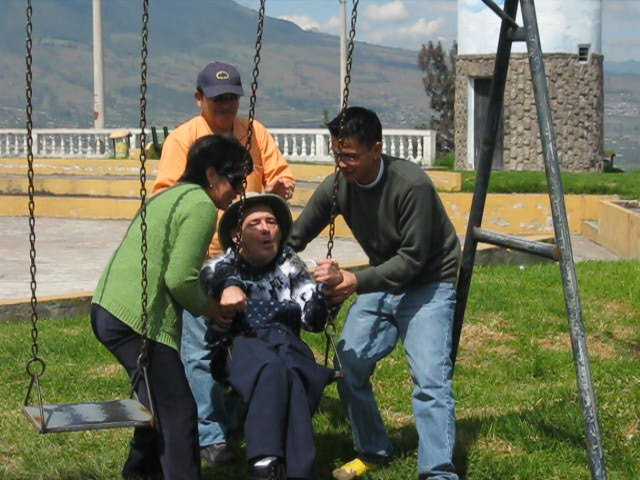 Another group we enjoy having over is friends that we’ve made since being in Ecuador. This weekend we got to entertain yet another group: fellow U.S. citizens. 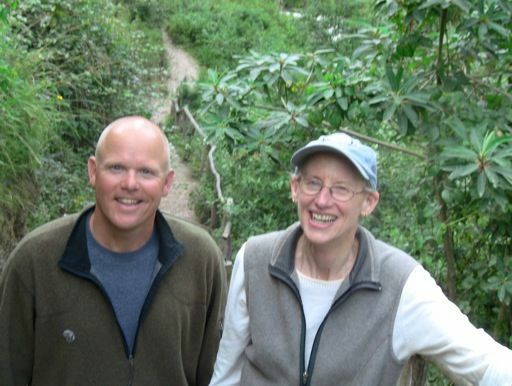 Today, Blanca brought Alison Robinson and Bill Arnold to Otavalo. 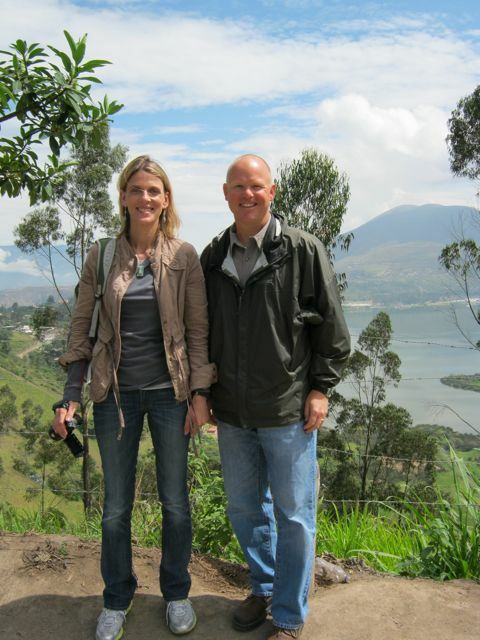 Bill and Alison are both teachers at a private school in Ft. Worth, Texas. Their program emphasizes service as well as the other subjects one would expect to find in a K-12 private school, and service opportunities are provided at local, regional, and national levels. Recently, it was decided that offering an international component as well would benefit the students. 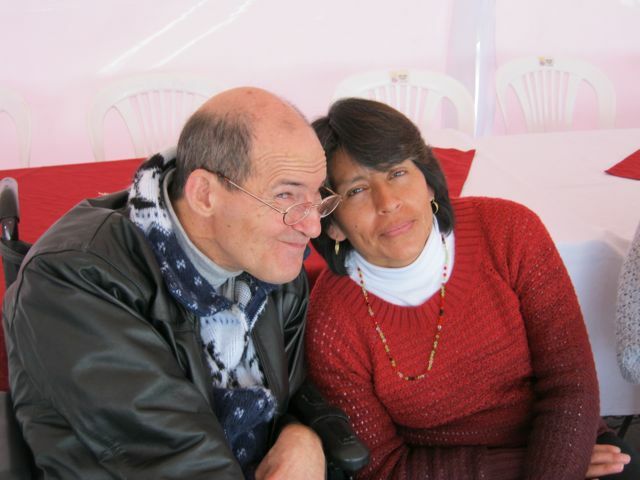 In researching possible international opportunities, it was learned that Bill had met Blanca Puma when she spoke at his church, University Christian Church in Ft. Worth. He suggested the school investigate FEDICE to see if there would be appropriate projects with which they could become involved. So here they are. 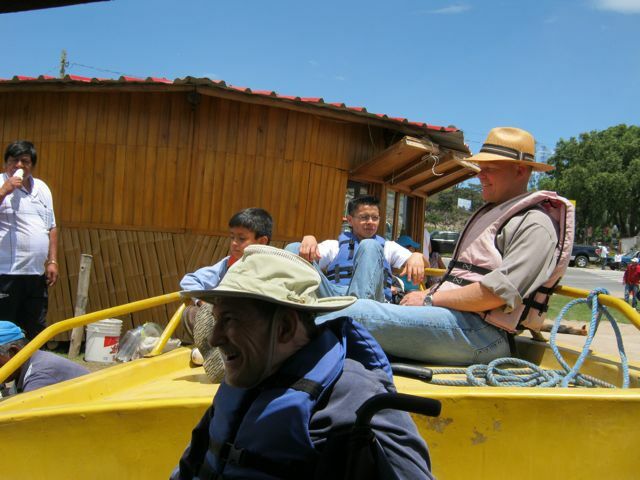 Blanca decided that, since they arrived on a Friday, their first stop should be Otavalo to talk with us about our lives here, as well as to visit the world-famous Otavaléno Saturday mercado (market). After sampling the goods for purchase in the mercado, they came over to our place for conversation and coffee. 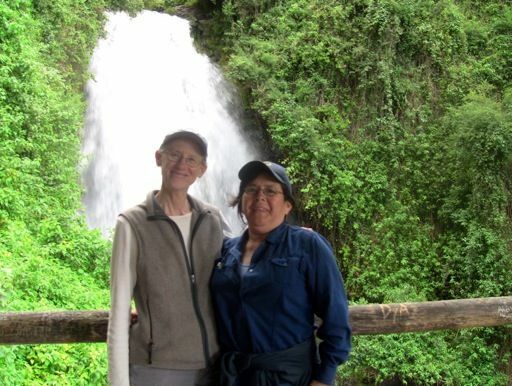 We talked for a good while before Marilyn, Blanca, and Luis took them to another attraction within walking distance of our house – Cascada de Peguche (Peguche waterfall). Marilyn likes to walk, so she brought them home the back way, even more beautiful than the main way in, which is used by most people. When everyone had returned, we had the traditional cena, a light evening meal, and more conversation. Prior, Isabel had told us that she and her family would eat in the cocina (kitchen) so we could talk business in the comedor (dining room) and we both said, “Nooooooooooo!” As far as we’re concerned, we’re one family, without any distinctions (except maybe kids and adults, to 8-year-old Brayan’s chagrin). Also, we knew they would provide delightful conversation, especially since Alison could speak Spanish a whole lot better than we could. Alison and Bill stayed at the Hotel Ally Micuy (our former home for eleven months), but Blanca and Luis spent the night here. They were our first overnight guests. The guest quarters aren’t ready yet, but Elvis graciously moved into Brayan’s room last night. Shortly after breakfast, Luis and Blanca picked up Alison and Bill at the hotel. They came here briefly, and then we all went sightseeing, with Marilyn acting as tour guide. As Blanca put it to Marilyn, “We are in your hands today!” Marilyn and I had already discussed which of our favorite places they might enjoy most, given their limited time with us. Since Luis and Blanca had the FEDICE truck, we didn’t have to overload Molly, our faithful 17-year-old Chevrolet Vitara, because we wanted it to be an outing for the family, also. Alison commented that it was smart to have a car that blended into the community. Maybe the car blends in, but I’m not sure how much a tall, blond, blue-eyed woman and a guy in a wheelchair blend in around here. Our first stop was Arcángel San Miguel (Saint Michael the Arch Angel). This is a large statue overlooking the provincial capital of Ibarra. 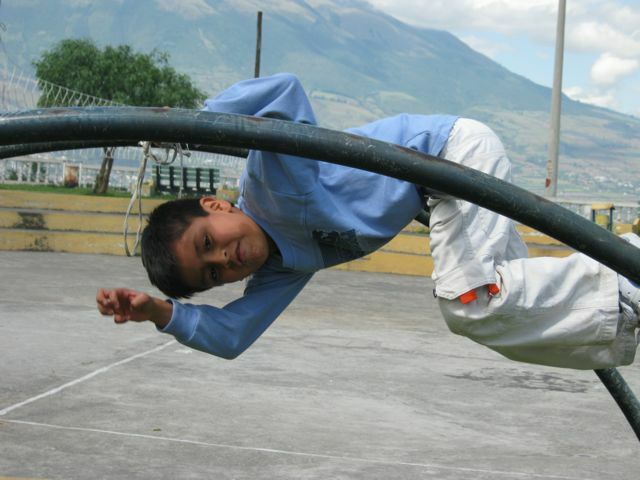 It has great views of Ibarra and vulcáns Imbabura, Cotacachi, and (I believe) Cusin. Cusin is not as grand or as well known as Imbabura and Cotacachi, but it’s a pretty volcanic mountain in its own right. The views were especially good because the weather was absolutely gorgeous today. In fact, it wasn’t long before I shed my trademark suéter, gorra, and bufanda (sweater, cap, and scarf). There’s also a good view of Lago Yahuarcocha (Lake of Blood), which was our next stop. It’s called Lake of Blood because a fierce battle was fought on its shores between the Inca and Caranqui (indigenous peoples). We drove down to the lake via a back road that Marilyn and I had discovered, because it was more scenic than waiting in line on the Panavial (Pan American highway) with scores of other cars and trucks. We would never do it just to avoid the $0.50/car entrance fee. ;) The first thing on our agenda was to take a boat ride around the lake, so we turned right at the lake in an attempt to get to the boat docks via the shortest distance. Today, however, they were having 18-wheeler truck cab races at the Yaruahcocha racetrack and we were turned back as we neared our destination. So, we went back around the lake in the opposite direction. We were stopped again at the official entrance to the lake, but this time we were close enough to park and walk to the docks. Rather than walking to the boat we usually take, we stopped at the first one with passenger space. This one had a slightly different configuration and I concluded there was no space for my wheelchair. 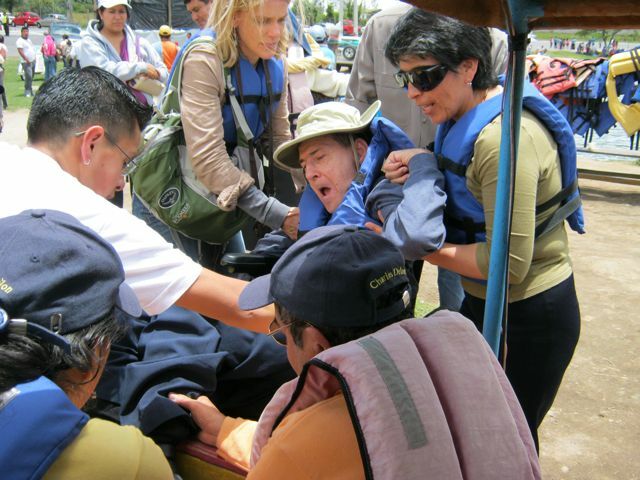 I was lifted into a seat and prepared to leave my wheelchair behind. However, the seat was so small that I kept sliding out, because I couldn’t bend properly at the waist and also had a life vest on that tended to push me forward. I decided to get back out and wait for everyone else to return because I couldn’t get comfortable. But people insisted there was room for my silla de rueda (wheelchair). I couldn’t see what space they were talking about, but they proved me wrong, lowering my wheelchair to a snug fit between the front seats and the bulkhead. I was comfortable again! Next, we went to one of our favorite places for tilapia on the lake. It’s elevated about twenty feet and has a very nice view of the lush, dark-green totora reeds that line much of the lake’s shore. Locals harvest them, dry them, and weave them into large mats. Of course, we go to the restaurant primarily because the tilapia, fried or baked, is always good. Blanca and Luis introduced us to this restaurant not long after we moved to Otavalo last year and did not do us any injustice. 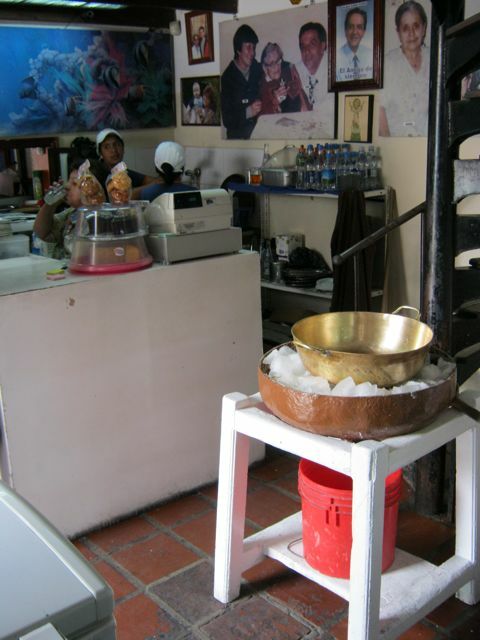 If Marilyn is the tour guide, and the tour gets anywhere close to Ibarra, you can count on one stop: Rosalie Suarez for heladoes de paila (ice cream made in a pan). As usual, everyone enjoyed it. Plus, we got to see how it was made. A mixture of primarily juice is poured into a large shallow pan that has handles on each side. The pan is put on a bed of ice and salt. Then someone uses one of the handles of the pan to spin it rapidly. The centrifugal force causes the mixture to migrate to the pan’s sides, where it cools to form ice cream. Actually, it’s more of a sorbet, but is called helado, or ice cream. They said it takes ten minutes to make a liter (about a quart) of helado. We walked around historic Ibarra for a bit before heading to the final stop on the tour, which was the town of Cotacachi, between Ibarra and Otavalo. Cotacachi specializes in making and selling leather goods. The prices are really good compared to those in the U.S. We know of another town south of Quito named Quisipincha that specializes in the same thing and has even lower prices. However, it’s farther off the beaten path, and certainly not in our neighborhood. When Bill and Alison left for Victor’s, our entertaining was over, at least for this weekend. It certainly had been a pleasure to be entrusted with the opportunity to show fellow U.S. citizens around our “neck of the woods”. Victoria is 87 years old and has had cancer for a long time. In fact, it’s been calculated that she was diagnosed with cancer 32 years ago. Thirty-two years – and given six to twelve months to live at the time of diagnosis. Marilyn took Victoria to the hospital this morning. She’s been in acute pain for a couple of days. I often hear her moan, or pray, or maybe both, in her room. She and Isabel got back about 1:00 p.m. X-rays show her cancerous mass has gotten bigger and is impinging on both her urethra and intestines. Therefore, the food she eats is hard to pass in solid form. The doctor recommended a liquid diet. No operation will be performed. We all know, including Victoria, that she is dying. But we all accept it as part of life. There have been times in the last year when she has had to go to the hospital with acute pain. Each time, we have been prepared for the worst. But she is still with us, with her weather-worn face that is often creased with a smile. She has seen, heard, laughed about, and suffered more things than I can imagine during her lifetime. She has six living children. With my mother having passed away, and Marilyn’s mother far away, we are blessed to have her with us, for as long as she and God choose. Despite her frequent bouts with severe pain, Victoria often smiles and jokes. After going to the hospital yesterday with severe pain, she was up doing laundry this morning, despite our pleading for her to rest. Then she came to the study, where I hang out most often, and put her cold, wet hands on my cheek to get a reaction from me of, “Frio” (“Cold!”). That’s all she wanted. When she got the reaction, she chuckled, turned, and left me to enjoy life more than I had before her “sneak attack”. I don’t understand a whole lot of what Victoria says, but I do understand the love, and kindness, and wisdom in her eyes. No one could miss it. After our stay in the states, I went to visit my ahijada, Natasha. She lives with her parents way up a mountain in Caluquí. Lucila, her mother, was expecting Glenn and me both, so had arranged to meet us downstairs in their bedroom, rather than upstairs in their living room. Natasha was very pleased to receive the stuffed doll/animal that we had gotten her. It was a pig dressed in a dancing dress and Natasha loved it. As we sat and visited, it was increasingly apparent that Lucila was very concerned about a rash over much of Natasha’s body. Lucila’s mother, Maria Rosa, brought over some food for us (she lives next door) and there was conversation as to why Natasha had itchy welts. Then, a short while later, when Natasha’s father, Elias arrived, he too got in on the concerned conversation. 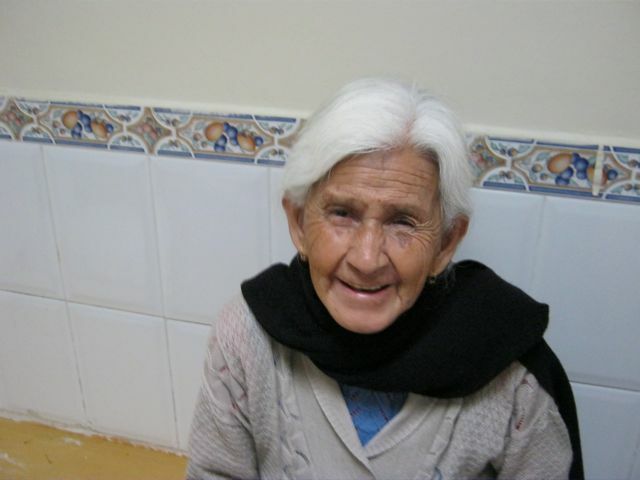 Lucila asked me if I knew of a good pediatrician in Otavalo. 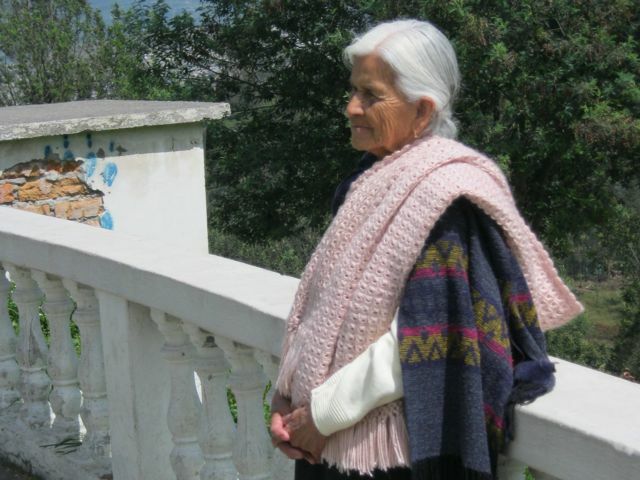 I suspected that Isabel did, as she had raised two children in Otavalo. We immediately called her on my cell phone. She had come with me as far as Espejo where she was visiting her father. Espejo is around 3 miles closer to Otavalo than Caluquí. The plan was for her to return on the bus so neither of us had to worry about connecting at a certain time. 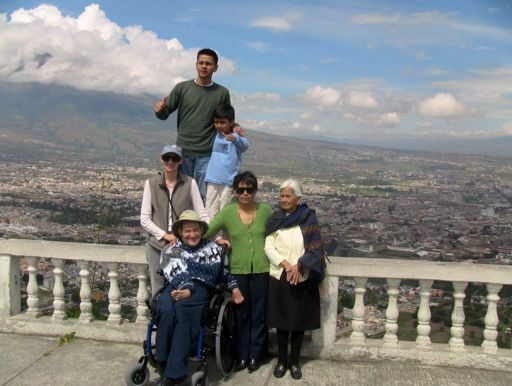 She was about finished with her visit and recommended taking Natasha to the hospital in Otavalo. We picked Isabel up at the bus stop in Espejo and went directly to the hospital where she showed Lucila the ropes. One would think there would be signs of explanation or a check in desk, but no, everyone except people waiting for their loved ones are behind a closed door. Only one person is allowed to go into the “waiting area” with a sick person. Elias and I waited together in this anti area while Isabel accompanied Lucila and Natasha into the real waiting area. I suspect it was an hour before they got to see the doctor. The doctor prescribed medications for Natasha who was diagnosed with an allergic reaction to something she ate. Isabel ushered us to the hospital pharmacy where one of the medications was available at a very cheap rate. She then took us down the street to a private pharmacy that costs more money for medications to fill the other prescription. She suggested to me that we invite the family over for cena and they accepted my invitation. Back at the house, Isabel quickly prepared a lovely meal, more special than our usual hot chocolate or café with rolls and jam. After pleasant conversation and welcome food, I took Natasha and her family home. This somewhat ordinary emergency was handled throughout with loving care by Isabel. Heartfelt concern and presence was calmly given all evening. It is the kind of love we feel on a daily basis sharing our home with Isabel and her family. Studying geology, I learned about Punctuated Equilibrium. It’s a theory that helps explain why evolution is not observed to be a continuous process. It’s especially helpful in explaining mass extinctions. Basically, it states that life is like the Mississippi river. For the most part, it flows evenly and steadily – it’s in equilibrium. But there are isolated events (too much rain, too little rain, a new dam, a breach in the levees or banks) that can drastically affect that flow, even make the river change course. These, of course, are the punctuation marks. I think of life down here as Punctuated Equilibrium. We'll be rocking along comfortably and then all of a sudden something needs to be done RIGHT NOW. For instance, today Marilyn went to visit our ajihada (goddaughter) and her family, and ended up taking the family to the hospital because Natasha, our ajihada, had an allergic reaction to something she ate. Fortunately, it wasn't serious and Marilyn was able to bring them over to our house for dinner. 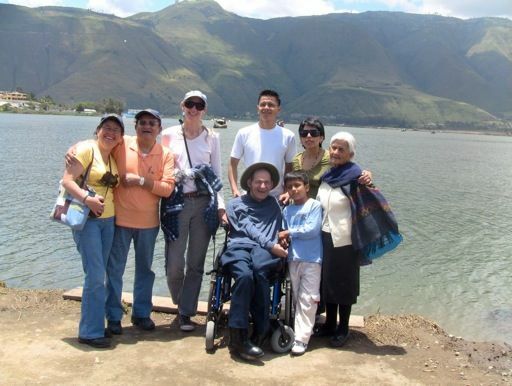 We all had a nice time with Lucila, Elias, and Natasha, including Isabel and family. Natasha really liked the doll we brought back from the U.S. When Marilyn took them back home, Isabel, Victoria, and Brayan went, too, so there were seven in a car designed for five. Our nice, stately, well-planned routine was punctuated by the needs of others with an emergency. Such is life. Everyone experiences Punctuated Equilibrium in one form or another. The best we can hope for is that it doesn’t make us go extinct!